iiSBE Taiwan - Dr. Day delivered a speech entitled "Lost in the Greater Symbiosis"
Dr. Day Yeong-tyi, one of TSSBE's Director, was invited to be part of the committee of judges at the 5+2 Environmental Art Design Cup of China Institute of Architectural Decoration and Design held by the Sichuan Fine Arts Institute from Oct. 24 to Oct. 25, 2015. Based on the themes "interconnection" and "symbiosis", the contest was open to environmental design schools in western China. Gold, silver and bronze medal winners were selected under the categories: architecture, landscape and combination. The day after the contest, Dr. Day delivered a speech at the forum entitled "Lost in the Greater Symbiosis", which was about the blind spots in human thinking and self-salvation in a world of climate change and frequent disasters. 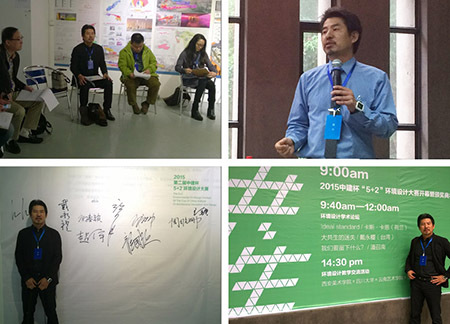 Dr. Day also served as a commentator in the symposium for exchanges in environmental design teaching.